Hey folks! I don't know about you, but I have always loved playing board games. (Unfortunately for me, I was an only child and had to talk my parents into playing with me!) Not surprisingly, John and I didn't play nearly as many games as we used to after we had Myka. It's not that we didn't have time to, but...It's a little hard, to say the least, trying to play a board game with a baby/toddler trying to move all of your pieces or steal cards. I'm not gonna lie: I was kind of sad that we wouldn't get to play games again for several years, and even longer for Myka to actually be able to play any with us. With that being said, I was excited to learn in the last year or so that there are companies out there that actually make board games for little kids! 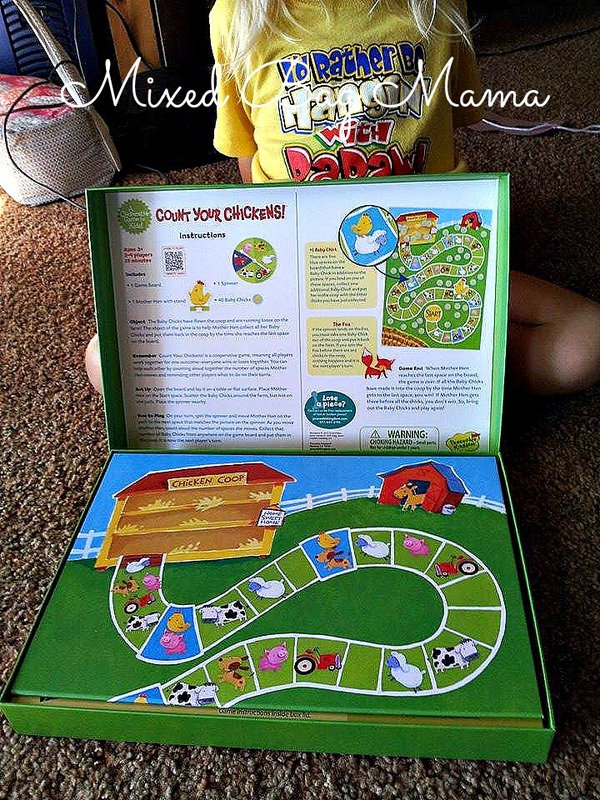 Peaceable Kingdom is one such company, specializing in cooperative games. 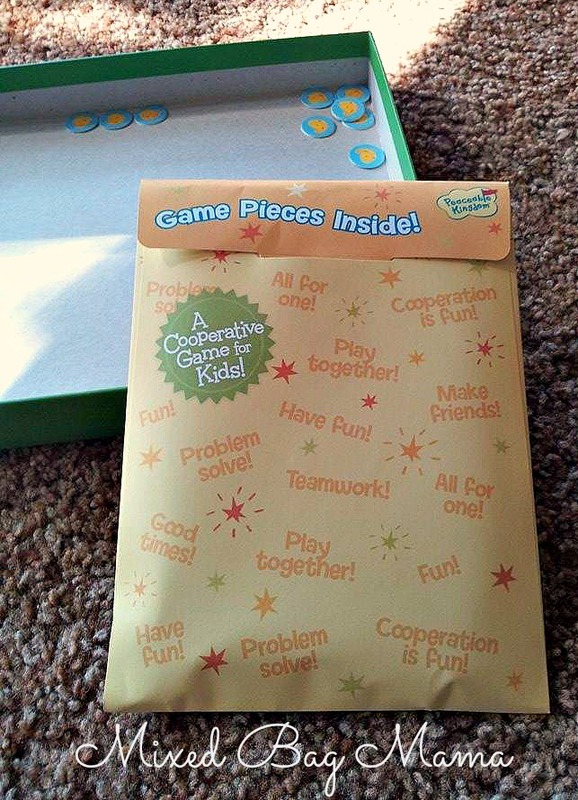 What are cooperative kids games, you ask? Instead of competing against other players, you all work together towards a goal. I think this is such a great idea for young kids because 1) Losing can be a tough thing for kids to understand and process and 2) It helps teach them how to work as a group. She was very excited about getting a game! 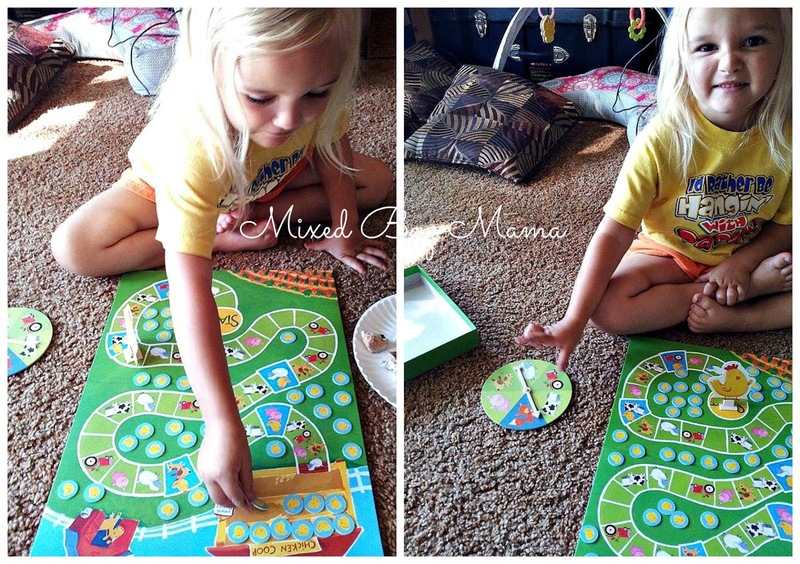 Straight forward, easy to understand game board and simple instructions. *This was a great choice for us because, if you've read any of my homesteading posts, you'll know that chickens are a big part of life around here! In fact, Myka figured out the premise to the game without even realizing it and before I explained further just by me telling her that the baby chicks had escaped from the coop. “Oh no! We have to put them back!” ha ha! *Count Your Chickens is geared towards children aged 3+, so I like that this was easy for her to catch on to with minimal explaining. *I'm sure if you're reading this, you're aware of how short little one's attention spans can be. Count Your Chickens takes roughly 15 minutes to play, give or take. This seems to be just the right amount of time to keep them engaged without getting bored! *Again, kids can be sore losers. (Who am I kidding? So can adults!) That's why I like this cooperative game. Besides not having to deal with a temper tantrum over losing (Yes, technically, you can “lose” Count Your Chickens, but it seems very difficult to do so. We haven't yet! ), they are learning important life skills too, such as working together, taking turns, following directions, and more. I like things that make learning fun! 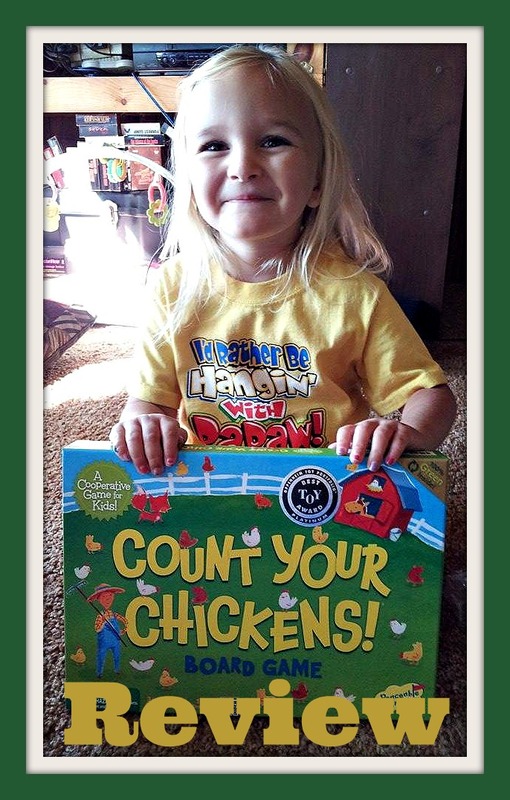 *Count Your Chickens also helps with learning numbers and counting in a fun way. *It's not just fun for kids either. It's been enjoyable for all of us (well, except Ripley ;) ) to play together. It's not mind-numbingly boring or, well, dumb, like you might expect a game for very young kids. Nice little storage envelope to keep all of your pieces in one spot! *I also thought it was neat to learn that the game board and pieces are 100% green, printed with soy-based inks and parts made with corn-based plastic and FSC wood. *I would definitely recommend (and have already!) and buy other games from Peaceable Kingdom. 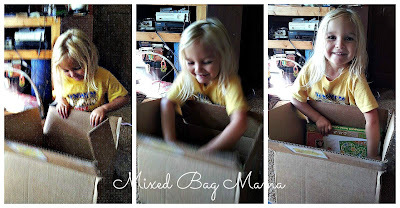 They make for great learning and family fun and are affordable. You can purchase your own Count Your Chickens game for just $15.99. Be sure to check out all of Peaceable Kingdom's games (and stickers, tattoos, and greeting cards!) and stay up-to-date with them on Facebook, Twitter, Pinterest, Instagram, and YouTube. What a darling game! My toddler would love this I'm sure. I can't wait until she's a bit older so we can play games together. Thanks for joining the Family Joy Link Party!